Summer has officially come to an end, and that time gave me a good chance to try out three (of what I consider to be) skincare staples for spending time in the sunshine. What can I say? 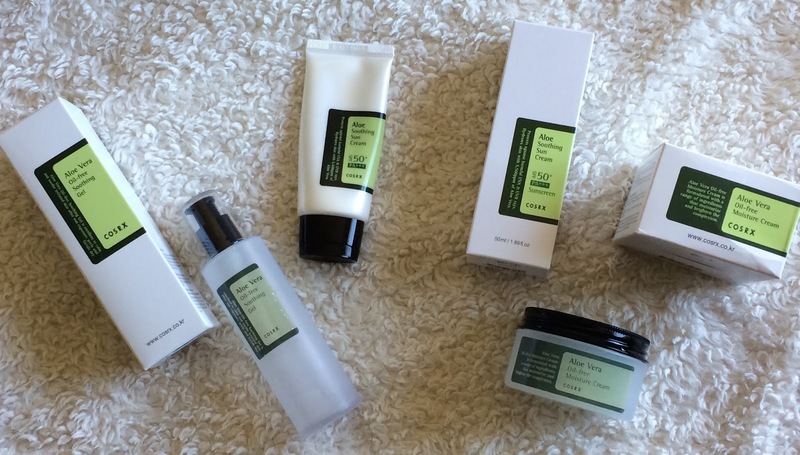 Cosrx just does skincare right! Aloe Vera is commonly known for soothing sunburn, but believe it or not it can offer more than just that. Aloe is a gel that comes from inside an aloe vera plant, that holds the plants moisture so it can go long periods of time without needing water. 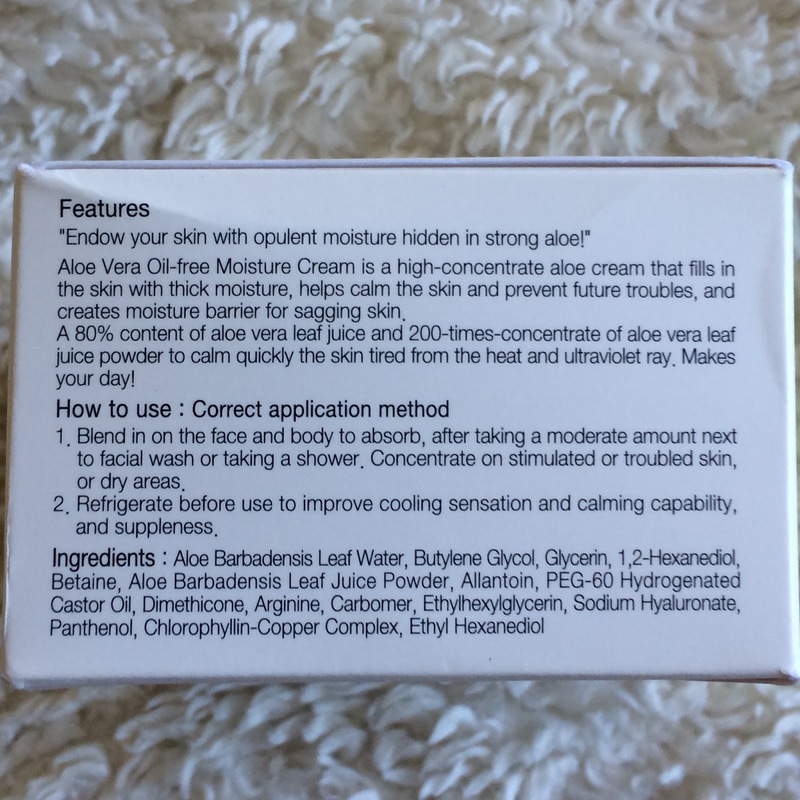 When consumed, aloe acts as a laxative - but when applies to the skin it has quite the opposite effect. Aloe is not only good for healing sun burn, but it soothes other skin irritations, provides light hydration to the skin, and can help calm outbreaks of acne and psoriasis. In this post I'm going to introduce you to the Cosrx Aloe Sun Cream (sunscreen), Soothing Gel, and Moisture Cream. 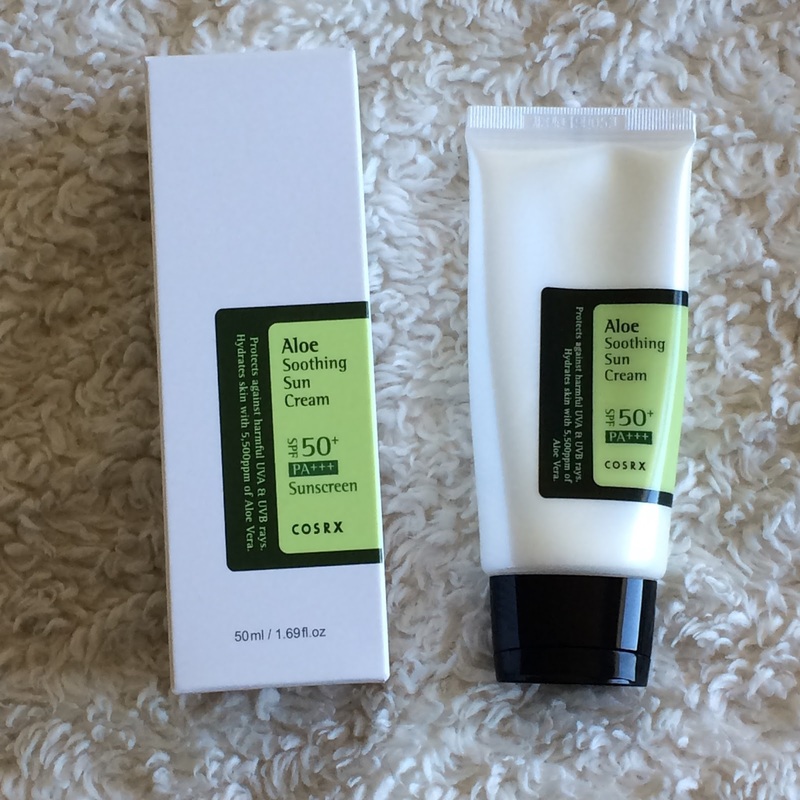 The Cosrx Aloe Soothing Sun Cream is a SPF 50+ PA+++ Sunscreen that protects against both UVA and UVB rays. It comes in a soft squeeze tube, with a flip-top cap at the base. It contains 5,500ppm of aloe vera to hydrate the skin while wearing. 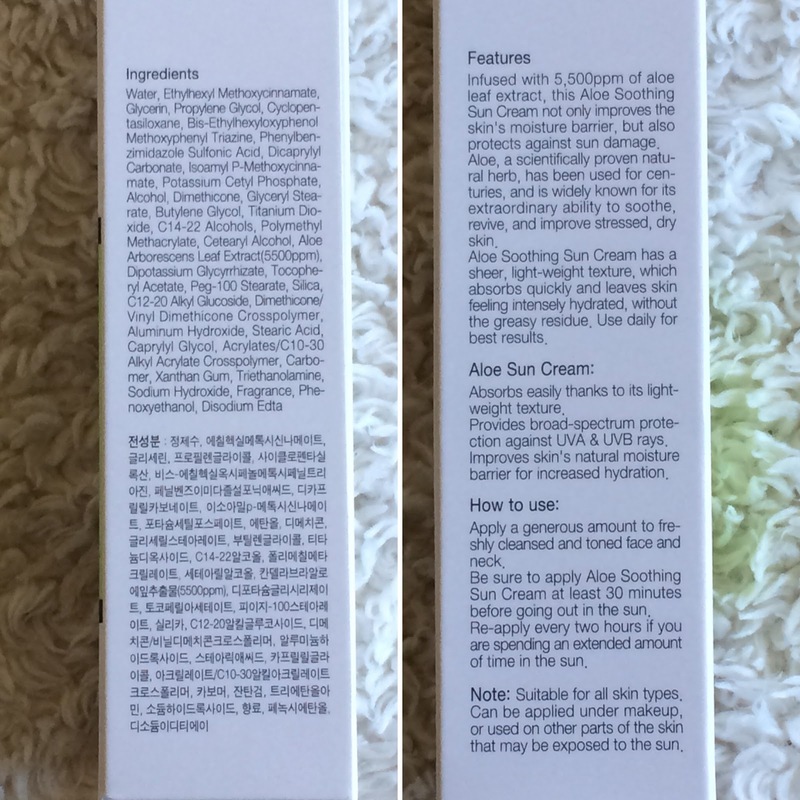 The cream itself is opaque with a light green tint to it, and has a light perfume-y aloe scent that fades slowly after application. 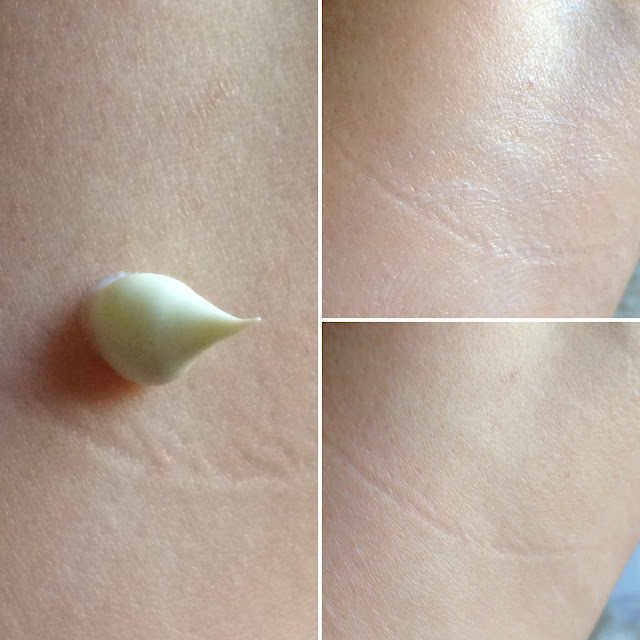 I personally love that there is virtually no white-cast after the sunscreen has absorbed, and it leaves your skin feeling very soft and smooth. 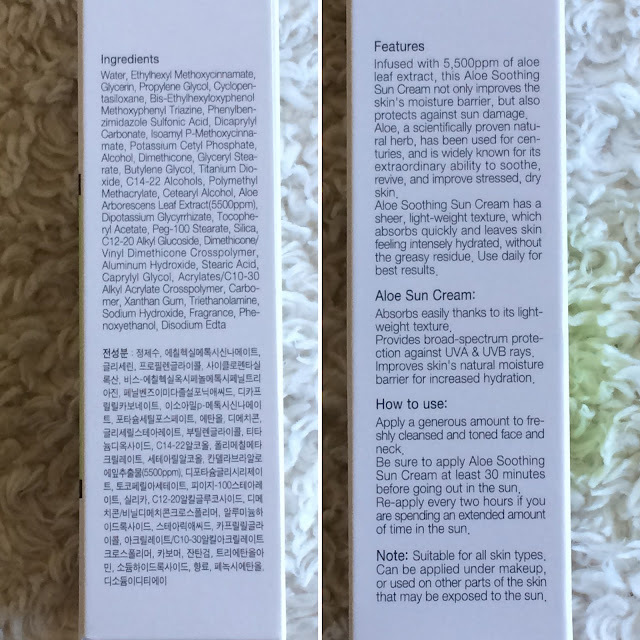 There is no dryness caused by this sunscreen in my experience, which is great, because I tend to peel while wearing most sunscreens. Ingredients: Water, Ethylhexyl Methoxycinnamate, Glycerin, Propylene Glycol, Cyclopentasiloxane, Bis-Ethylhexyloxyphenol, Methoxyphenyl Triazine, Phenylbenzimidazole Sulfonic Acid, Dicaprylyl Carbonate, Isoamyl P-Methoxycinnamate, Potassium Cetyl Phosphate, Alcohol,Dimethicone, Glyceryl Stearate, Butylene Glycol, Titanium Dioxide, C14-22 Alcohols, Polymethyl Methacrylate, Cetearyl Alcohol, Aloe Arborescens Leaf Extract(5500ppm), Dipotassium Glycyrrhizate, Tocopheryl Acetate, Peg-100 Stearate, Silica, C12-20 Alkyl Glucoside, Dimethicone/Vinyl Dimethicone Crosspolymer, Aluminum Hydroxide, Stearic Acid, Caprylyl Glycol, Acrylates/C10-30 Alkyl Acrylate Crosspolymer, Carbomer, Xanthan Gum, Triethanolamine, Sodium Hydroxide, Fragrance, Phenoxyethanol, Disodium EDTA. 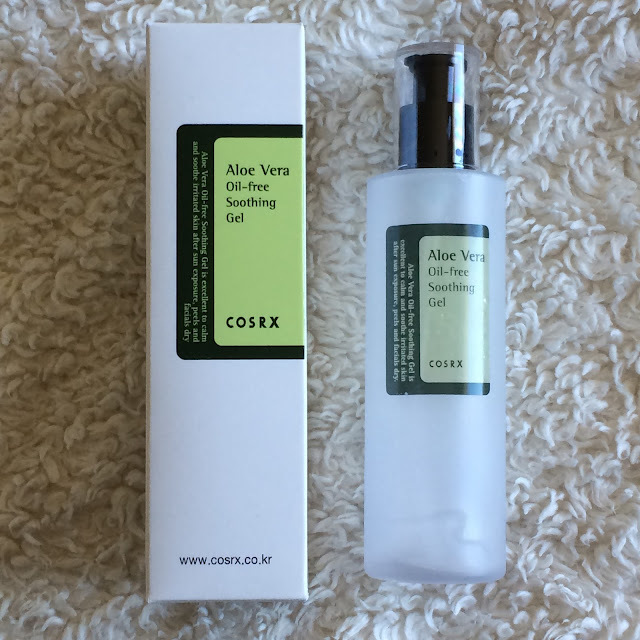 The Cosrx Aloe Vera Oil-Free Soothing Gel is a very lightweight liquid gel designed to calm and soothe irritated skin after sun exposure, facials, peels, or hydrate if your skin is dry. 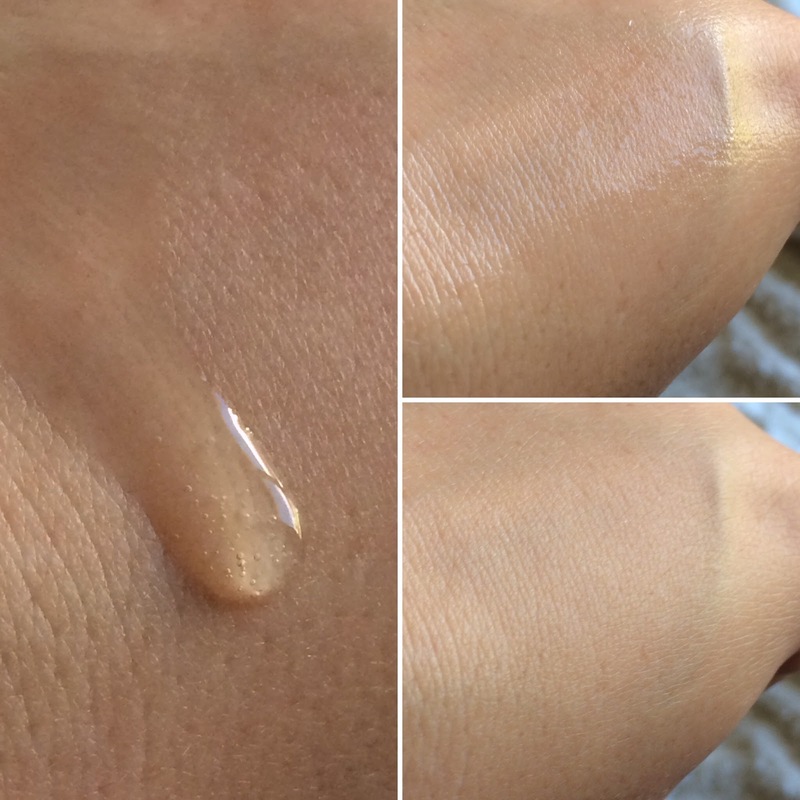 Instead of water, this gel contains 90% aloe vera juice to help build up your skins natural moisture barrier to help protect it from being irritated further and give it a chance to repair itself - and the addition of hyaluronic acid helps draw this moisture into the skin further. The gel comes in a pump bottle that is very easy to dispense. The gel itself is like a serum - liquidy but more viscous that water. It has virtually no scent - only very slightly of aloe vera - and is essentially clear in color. Since this is such a calming product, I like to use it most mornings to hydrate my skin before I moisturize, and to draw redness out of my acne and ease any flushing in my face. This gel is of course good if you've gotten too much sun, but I like having it as a regular part of my skincare routine. It leaves no sticky reside behind, which is difficult to find in aloe products. This product has, unfortunately, been discontinued by Cosrx, so I am an the lookout for something similar in performance and consistency. The Cosrx Aloe Vera Oil-Free Moisture Cream is designed to bring moisture back into your skins natural barrier. It contains 80% aloe vera to hydrate, calm, and protect the skin. The cream comes in a tub/jar, which may or may not include a spatula (depending where you purchase from). 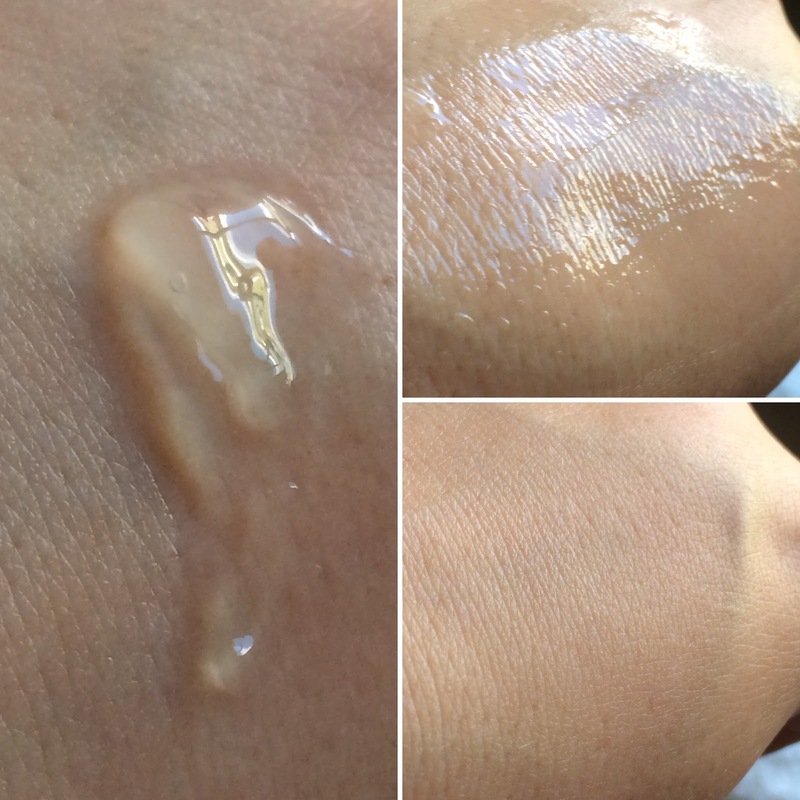 The gel has a very light scent, and is translucent with a green tinge of color. 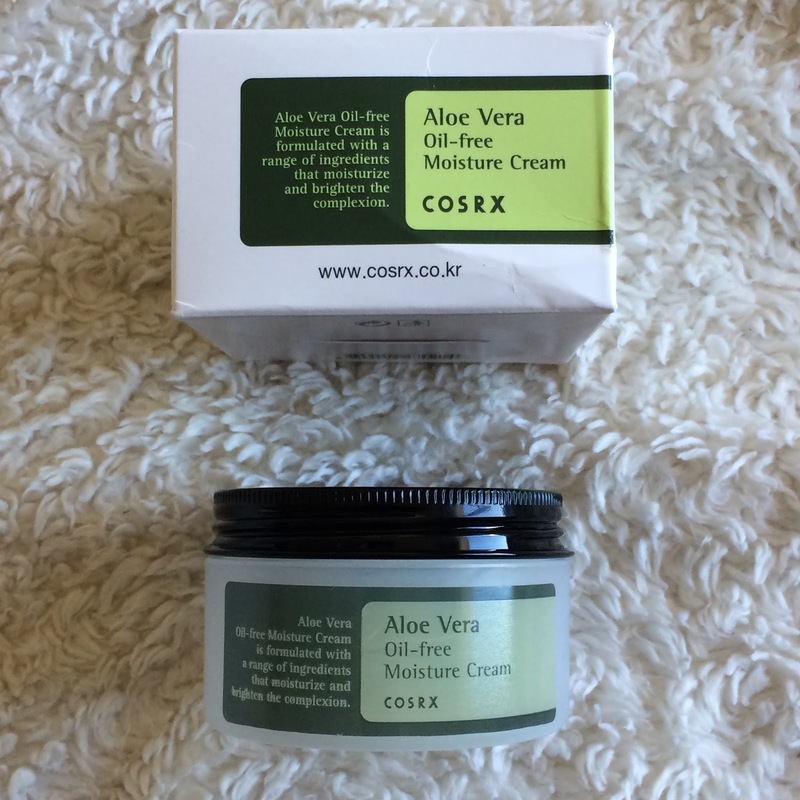 The addition of hyaluronic acid in this cream helps draw the aloe's moisture into the skin and chlorophyllin-copper complex helps heal skin damage and help protect the skin against environmental toxins. The cream absorbs immediately, being more a gel than a cream, and leaves the skin soft and hydrated. 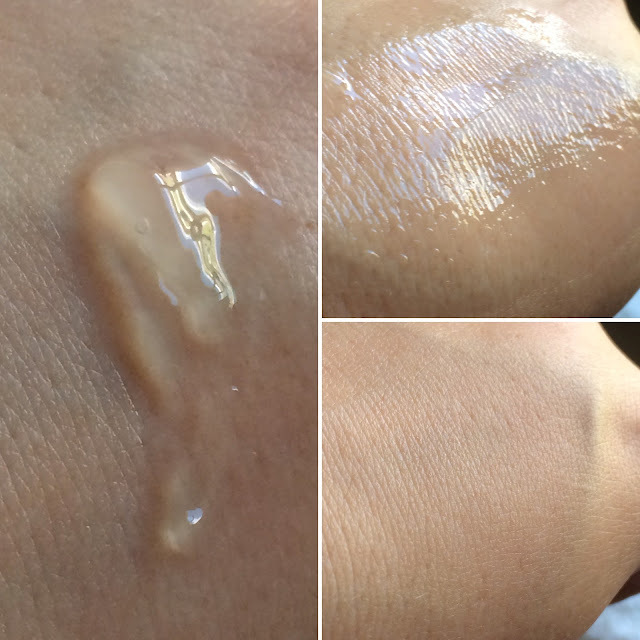 There is no sticky residue left behind, even when multiple layers are applied - which is uncommon for aloe vera products, and very much appreciated with this product. 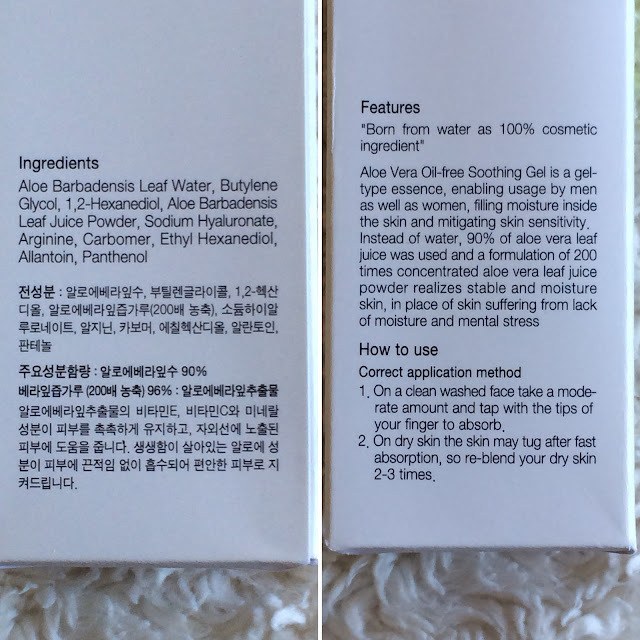 Ingredients: Aloe Barbadensis Leaf Water, Butylene Glycol, Glycerin, 1,2-Hexanediol, Betaine, Aloe Barbadensis Leaf Juice Powder, Allantoin, PEG-60 Hydrogenated Castor Oil, Dimethicone, Arginine, Carbomer, Ethylhexylglycerin, Sodium Hyaluronate, Panthenol, Chlorophyllin-Copper Complex, Ethyl Hexanediol. I've heard good things about this sun cream (güneş kremi) product. Going on my wish list now!